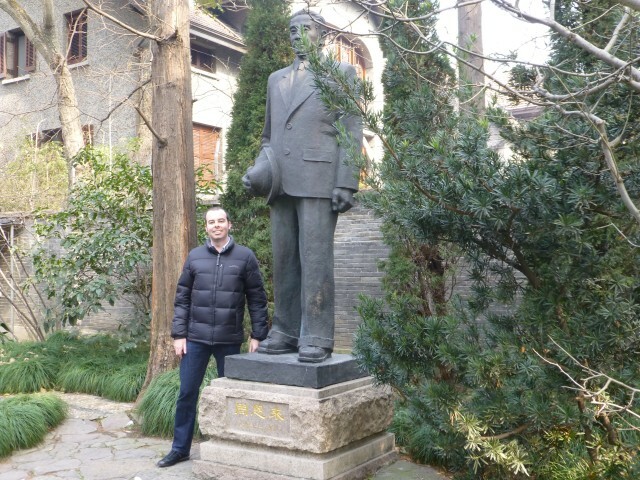 50 Hours In Shanghai. You have to eat. 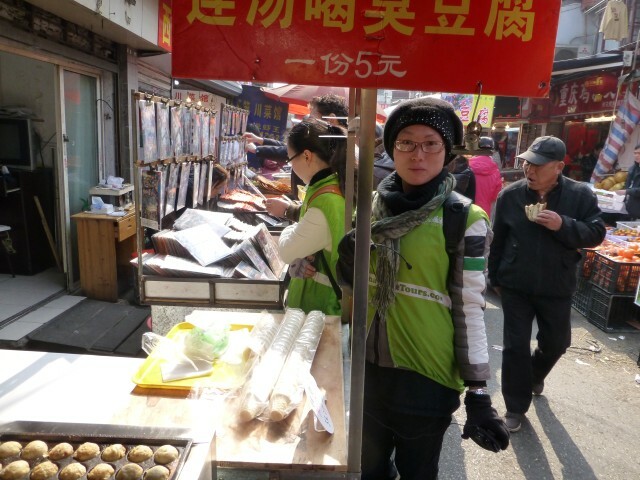 As you saw on my pre-departure list of Must Dos, I wanted to eat at a dumpling stand. 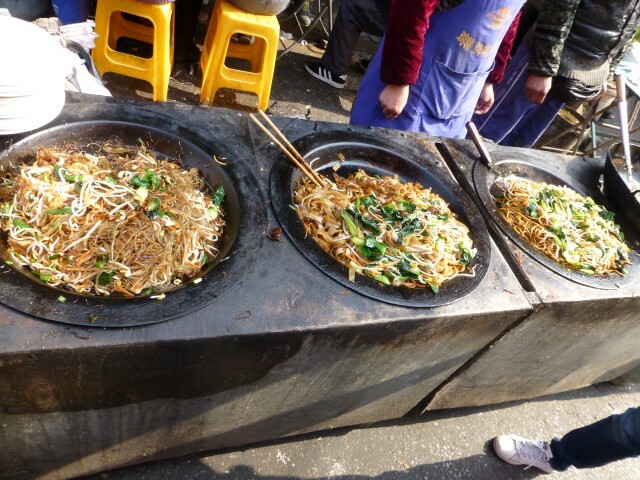 This means Shanghai Street Food. 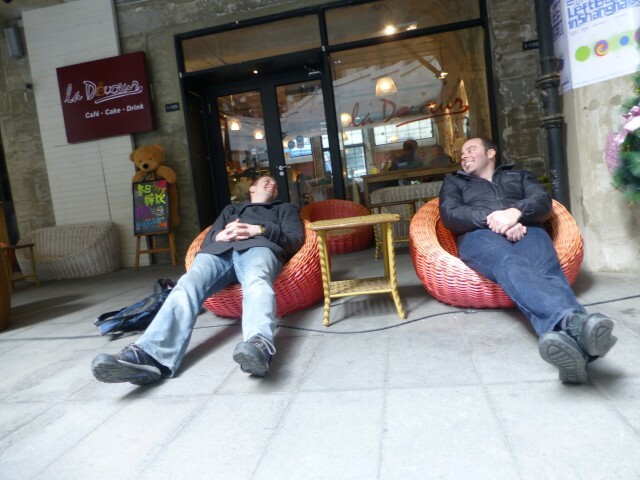 Our Cycle Shanghai tour guides were only too happy to oblige. At around 13h30 we came across a small street utterly packed with food stalls. The smells were amazing – you could smell the hot grease and a little spice. It was quite intoxicating. We didn’t find anyone on this street who spoke English and none of the signs were in English either. While I think we could have ordered some food by pointing and confirming the number of items we wanted by counting on our fingers, we wouldn’t have really known what was in the dumpling: pork, shrimp, snout or foot. 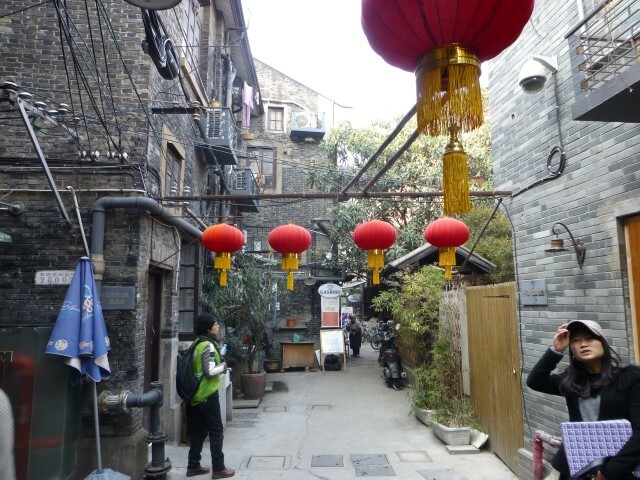 We walked up and down this small street a few times before we made the decision that we wanted to try some fried tofu, stinky tofu, Shanghai noodles, soup dumplings and bao (meat encased in dough and fried). What’s not to love about these options, eh? 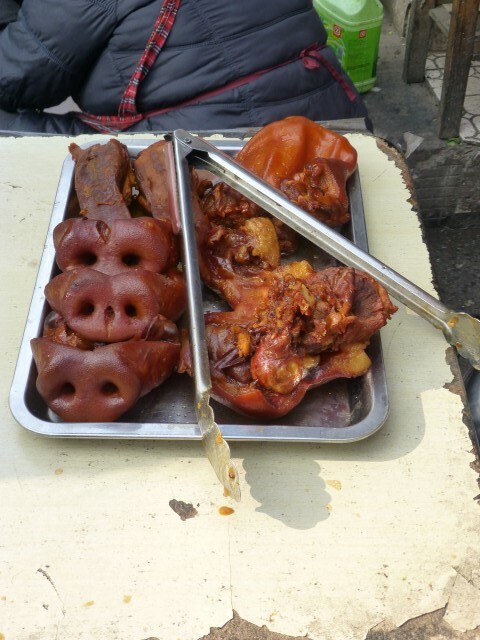 Snouts and other miscellany. We did not try these. The bao and wontons were made fresh as you watched and were amazing. Various noodle dishes. We opted for the traditional Shanghai noodles (middle). 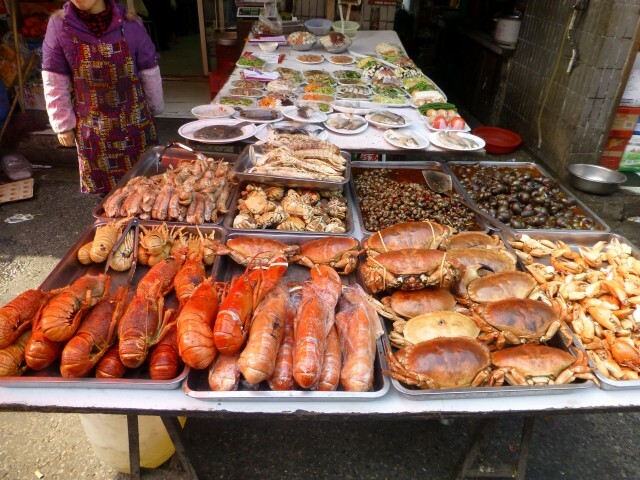 A wide array of seafood – ready to be selected and prepared. Our guide helping us place our lunch order. MS sitting on a squat stool enjoying our street food feast. 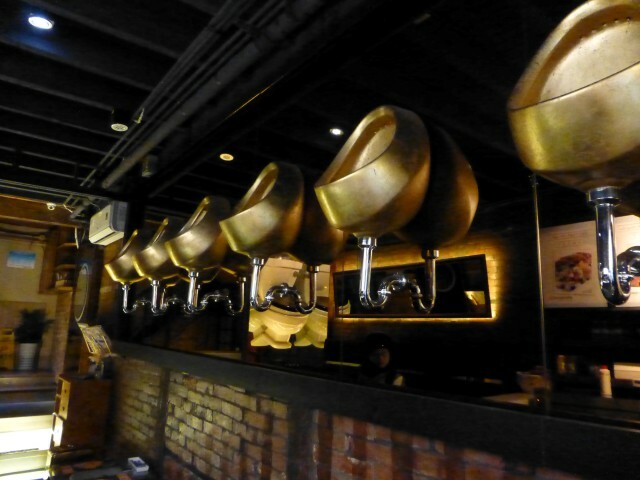 The steamed buns looked amazing, but we were absolutely stuffed after our amazing feast. We were quite hungry when we sat on our squat stools and began eating. Because everything looked so good, we ordered too much food. We ate only half of the Shanghai noodles (I found a very long hair wound around one of the noodles — no matter where I am in the world, once I see that I can’t eat any more of that item). The fried tofu and stinky tofu were pretty tasty. 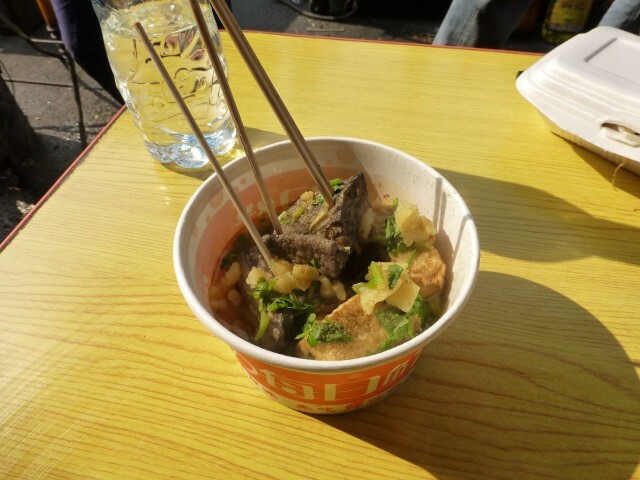 I’ve never had stinky tofu before and had heard that it was quite extreme. I found the stuff we had to be tame. It really wasn’t something that I loved and I probably wouldn’t SEEK it out again, but if I had the opportunity to eat it again, I wouldn’t shy away. The bao were very good, although I don’t know exactly what was inside. They were perfectly brown on the bottom (fried) and soft and doughy on the top. Great texture and also amazing flavor. My favorite item today was the small soup wontons. While I was more familiar with the large soup wontons (which we didn’t get) these were basically the same thing, except they were bite size. A word of caution — the outside of the wonton may be cool, but the soup is still blazing hot and will destroy your mouth if not careful. Be sure to take a little bite out of the top of the wonton to let some steam escape — then pop it all in your mouth. I will admit, I was a little nervous eating this food. 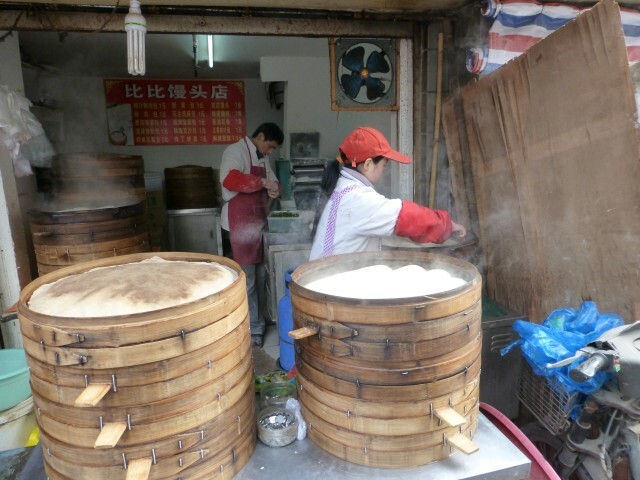 While hundreds of millions of Chinese eat like this every day – I do not. I was concerned that the conditions of the market may wreak havoc on my digestive system. I did come prepared with multiple forms of medicine on me that day. Above all, I’m happy to report we had no issues whatsoever. First off, while I think you can easily order food (maybe not knowing what you are getting) and be perfectly happy, I think you’d have a hell of a time finding this little market on your own. Take some time, find a guide and enjoy yourself. Be sure to bring some Imodium (as you should on every trip) just in case. 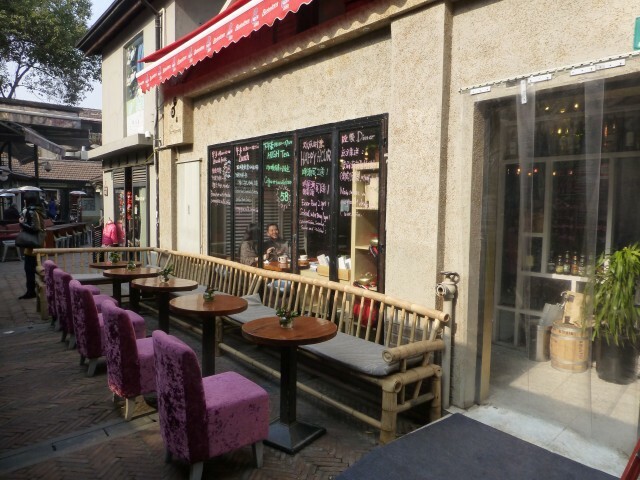 Finally, when all was said and done, we spend about 15rmb or $2.50 for lunch this day. Two of us ate very well and had about 1/3 of the food we ordered left when we were finished. 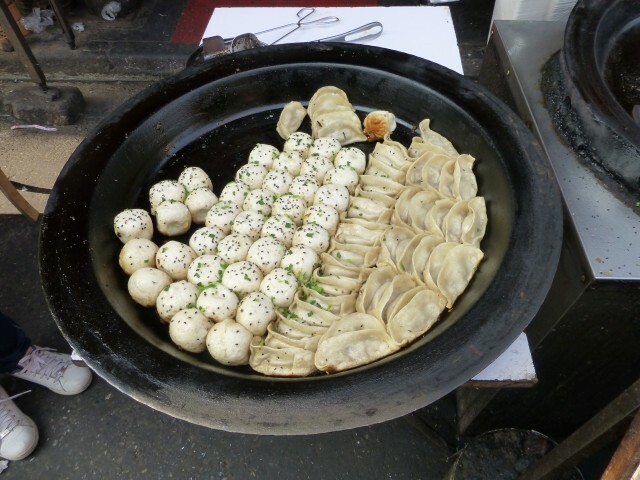 Do you love Shanghai Street Food? What is your favorite thing to eat at a street market? 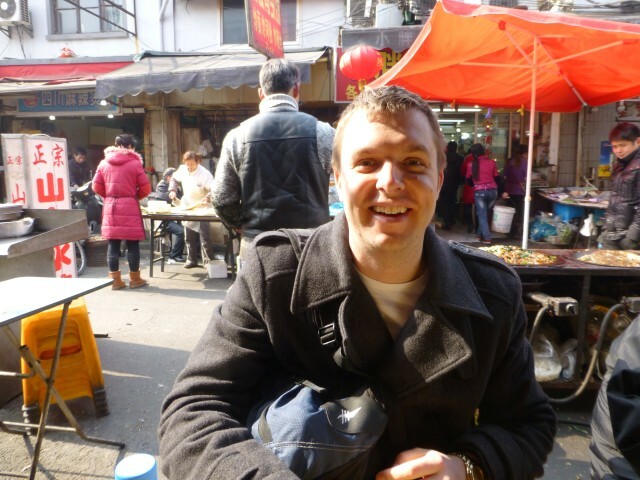 What was the most noteworthy thing you ate in Shanghai? Above all else, what would you recommend? I love bike tours. We try to do a tour in each City we visit, like in South Africa, Paris, Barcelona and Dublin. 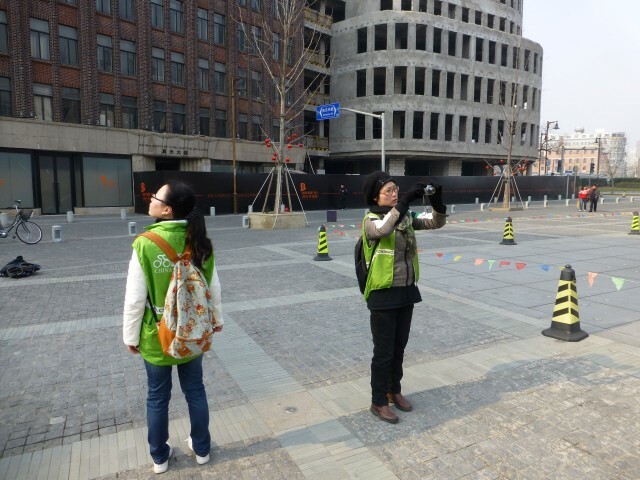 I found Cycle Shanghai on TripAdvisor and visited their website to book a tour. I never heard back from them following the online booking. 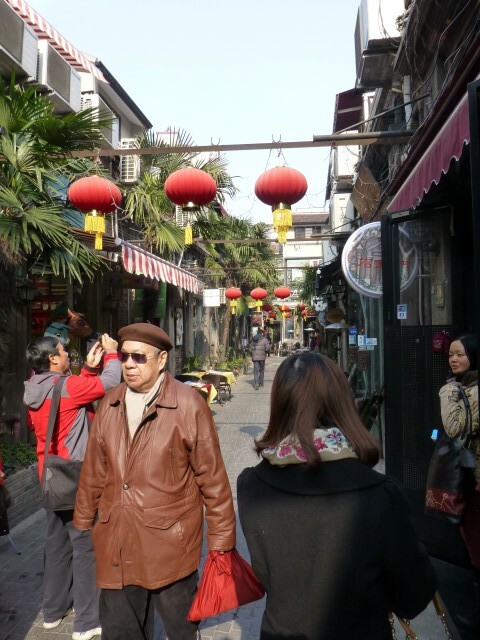 A few days before I arrived in Shanghai, I emailed them directly asking for a tour of Old Shanghai Saturday morning at 10h00. The next morning I received a confirmation email, along with the name and a map of our meeting place. We took the Metro and arrived right at 10am and found our bikes and our guides waiting right where they said they would be. We completed the obligatory paperwork and found that we were actually doing a private tour, not a regular public tour. We had a guide and a guide trainee. They asked what we wanted to see and then built the tour around our interests. I was a bit concerned as we started out as it didn’t seem like they had a plan on where we were going, but after about 15-20 minutes that feeling was gone. 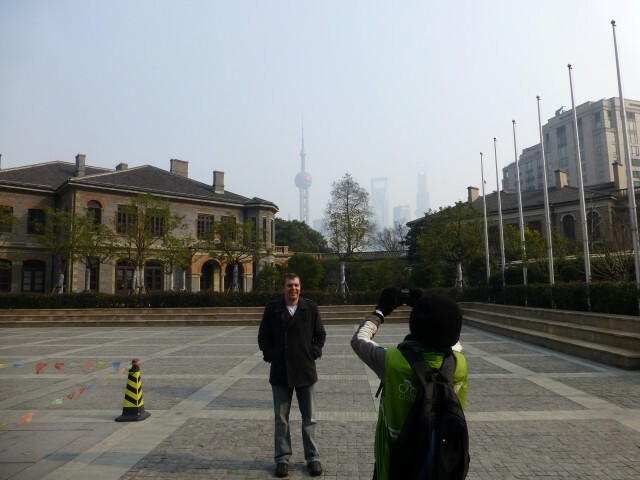 I told them we love architecture and wanted to explore the French Concession and Old Shanghai. And we’re off. We met at Central Plaza, hopped on our bikes and road down very busy streets talking briefly about the history of the area. We had a few stops on the trip where we hop off the bike and explore an area on foot. 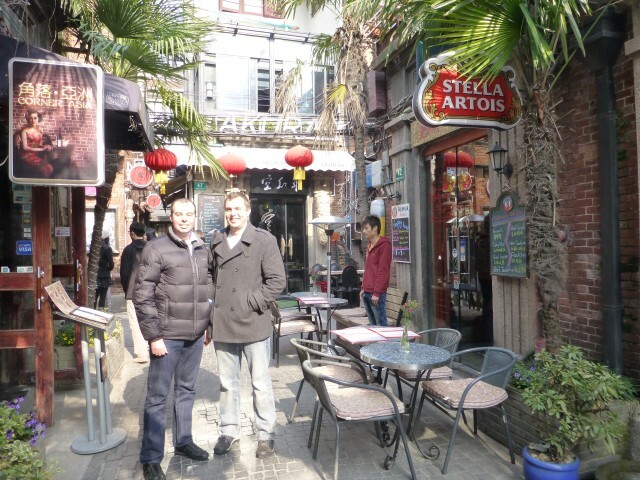 Our first stop was Tianzifang – an arts and crafts district in Shanghai. 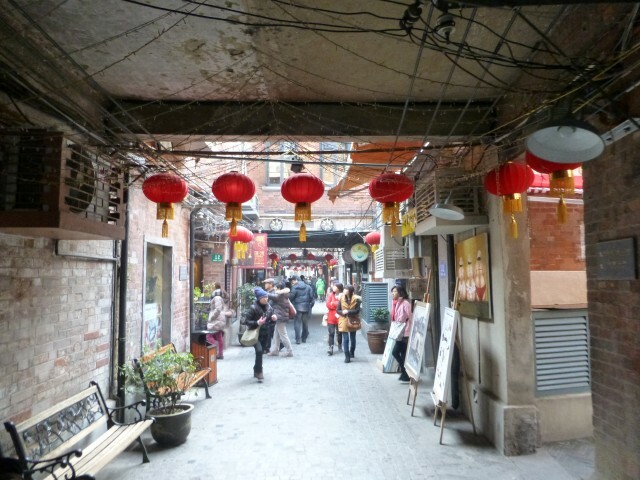 This area had many little restaurants, shops and galleries. 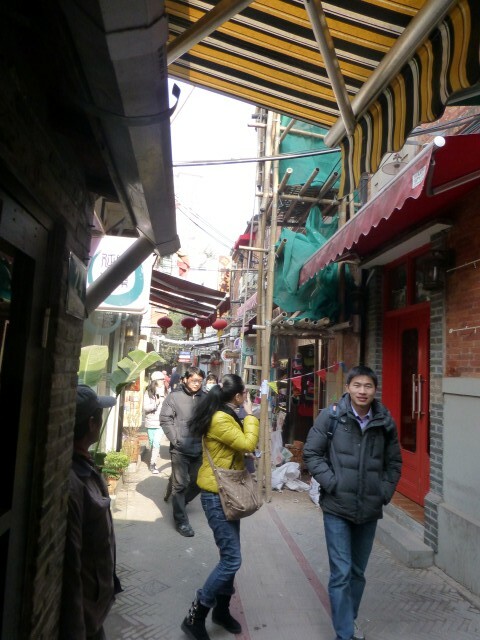 The streets/alleys were narrow and it was really a walking area. No motor bikes, no bikes and very few carts. It was pretty quiet when we were there, but evidently it is quite hopping later in the day and into the evening – which I can totally see. 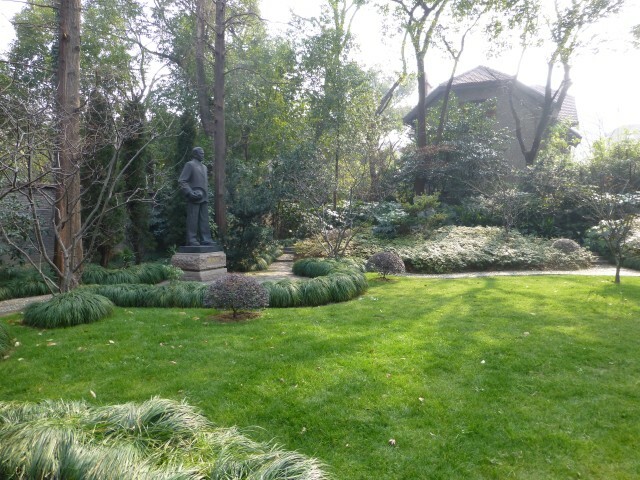 As we walked around Tianzifang we saw many stray (or wandering) cats. One of my favorite photos is of this police (army?) 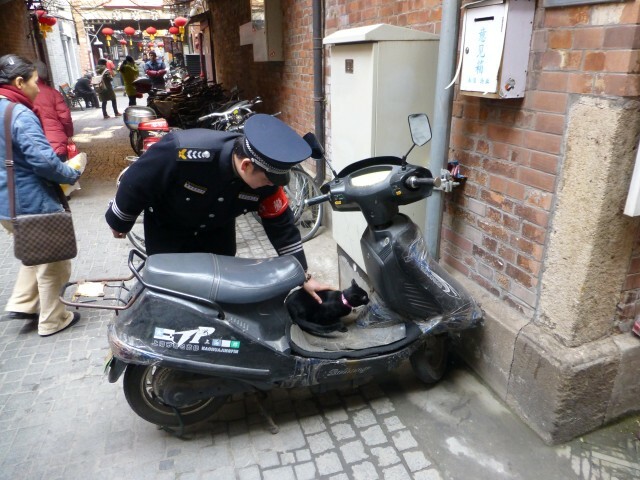 man taking time to stop and pet a stray cat on a motorbike. 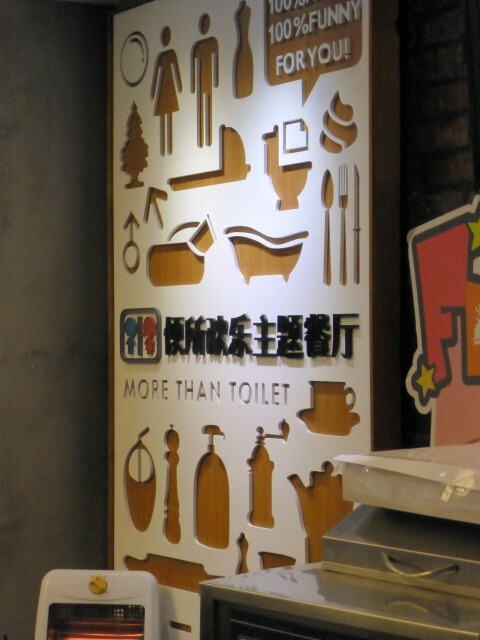 Before I left for Shanghai, I read many articles about restaurants and More Than Toilet was mentioned in several of these articles. 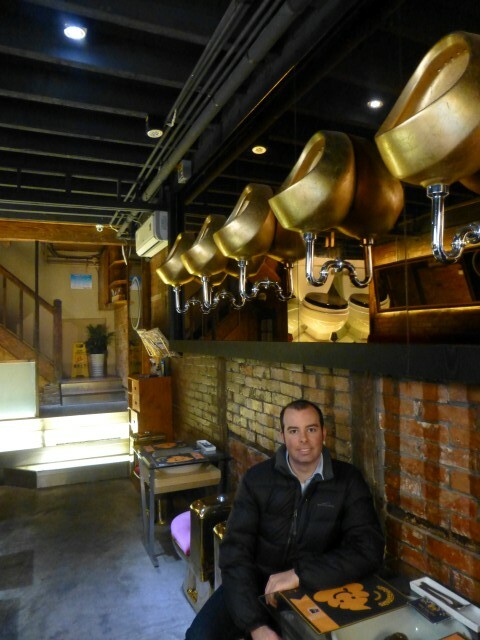 While I would never has sought out this restaurant, we did stumble across it in Tianzifang. 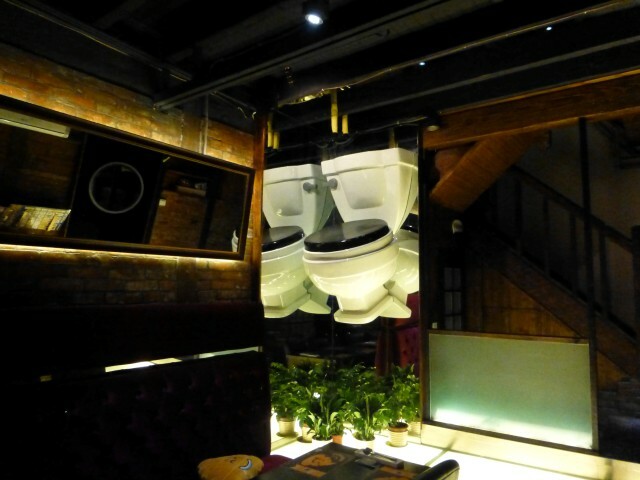 This restaurant has a toilet motif, with urinals on the walls, the seats at the tables are toilets and food is served in little toilet bowls. Oh and the food also looks like poop. Gross. Our guides demanded we get our pictures taken here. 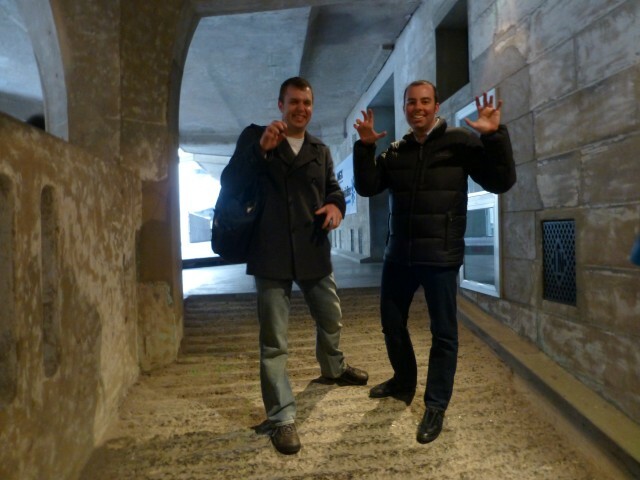 Throughout the tour, our guides would ask what else we wanted to see and each time they would ask, we’d agree. We want to see everything! 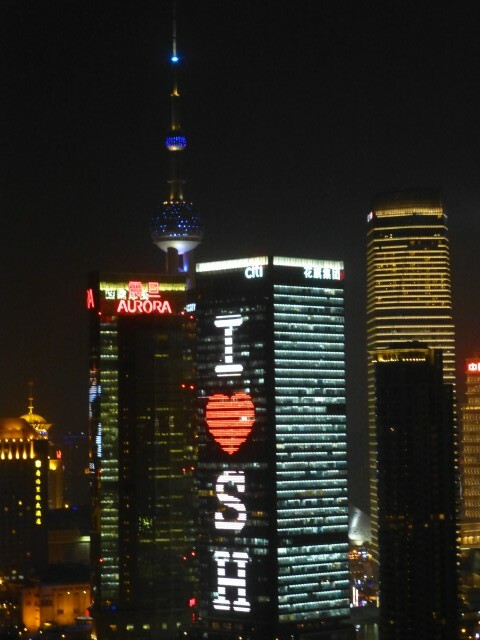 I’m in Shanghai for 50 hours, I want to see and do it all. 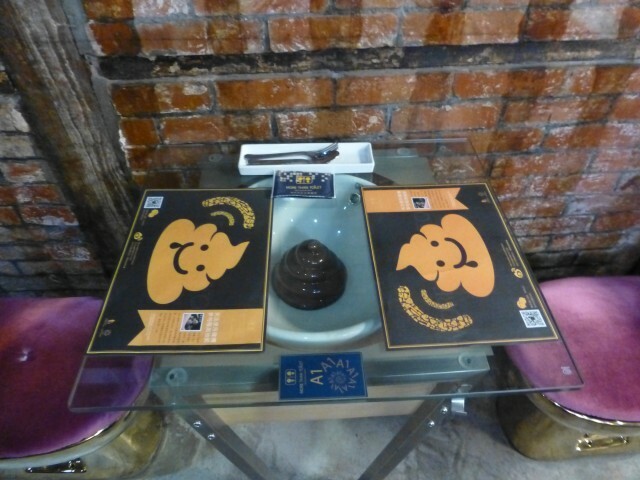 One of these options was to visit a home that was used as a training center for the young Communists in Shanghai. The house was well maintained, but not-surprisingly very Spartan. 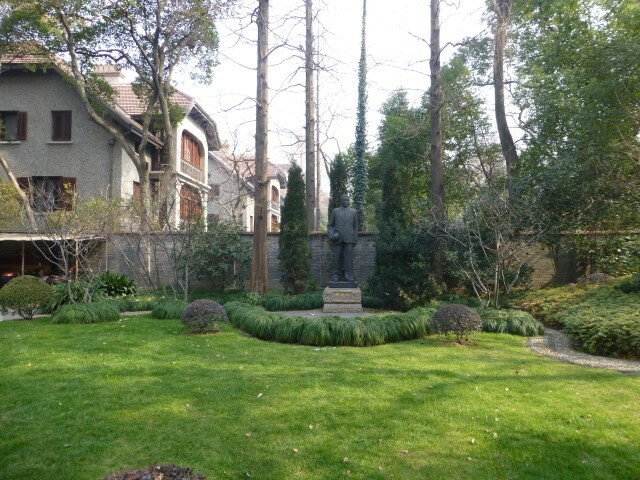 We were not allowed to photograph the interiors, but we could take pix outside in the garden. 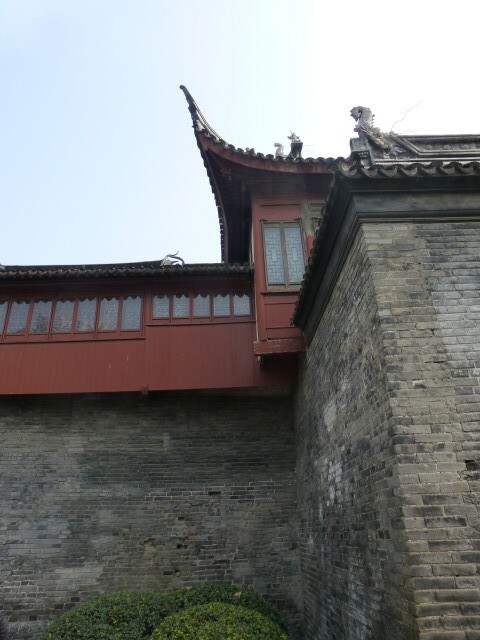 As we continued to say “YES” to everything our guides offered to show us, she asked if we wanted to see the Great Wall of China — which we knew was thousands of kilometers away, but we agreed, to see her response. She was taken aback — then she had an idea and we were off again. 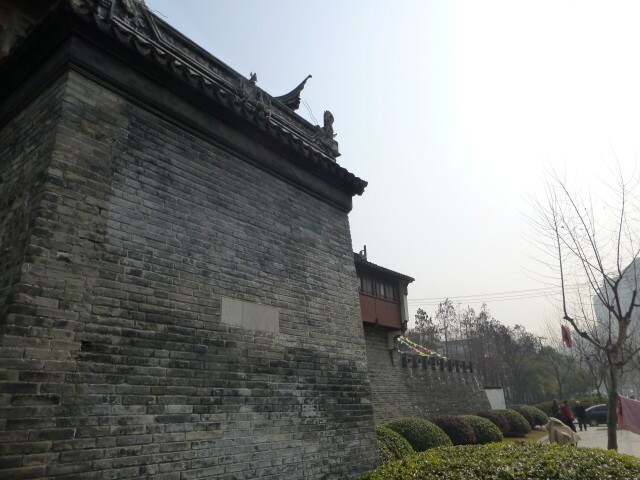 She brought us to the old City Walls of Shanghai. Well played. 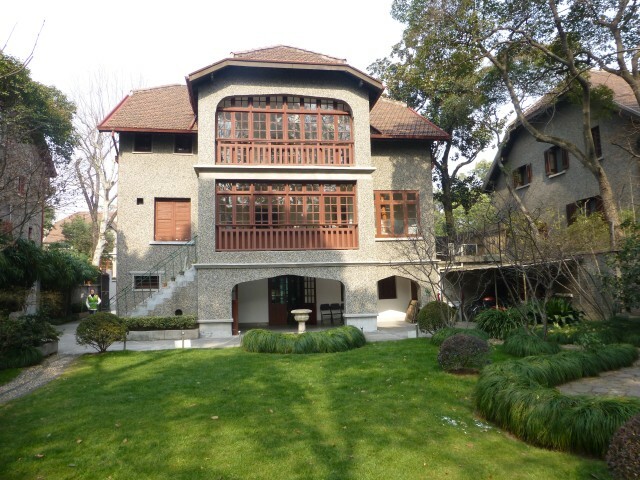 Throughout Shanghai there are these old mansions from the Colonial Era that are being rehabbed and turned into very high end vacation rental homes. 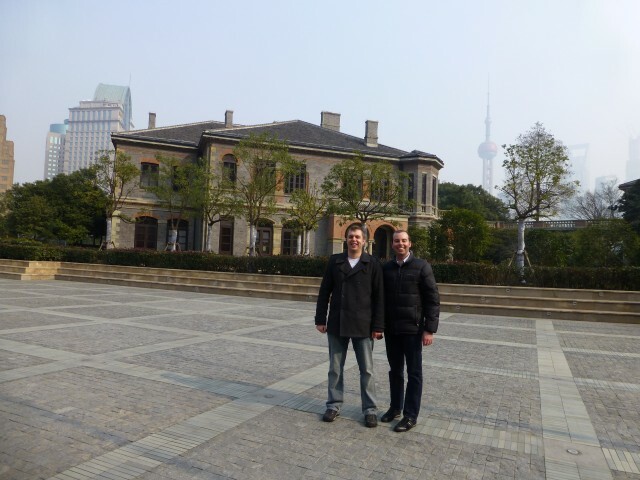 Our guide was very adamant that we get our photo taken in front of this home with the skyscrapers of Pudong in the distance – you can see the Oriental Pearl Tower and Shanghai World Financial Center. Our guides. One taking a photo of MS, the other exploring the area. Taking a photo of someone taking a photo. Just steps from the rehabbed house, we found a young couple getting their wedding photos taken. I love this guy’s jacket. …so we joined them for a quick photo! One of the last stops on our bike tour was an old slaughter house — and for some reason out guides highly suggested we pose like we are animals clawing or getting ready to attack…not sure why, but who are we to argue…here is our best attempt. slaughter house — how often does one get to say that? Our tour started at 10h00 and was scheduled to last about 3 hours, but our tour lasted until about 15h30 – all for the same price of 400rmb per person. 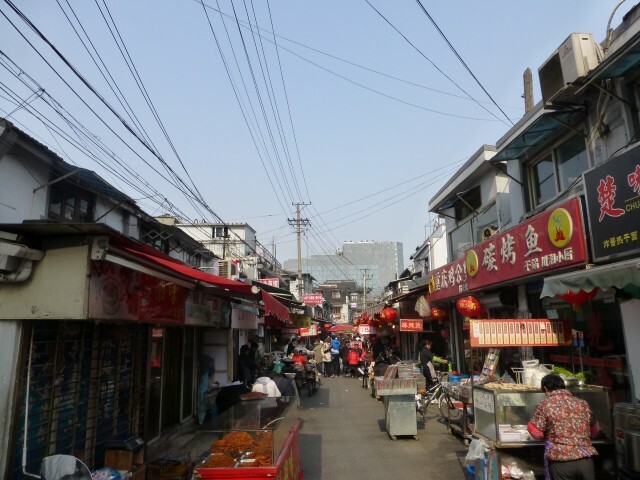 We visited a few markets including a food market and a plant and pet market. We also had lunch at a street market all part of this tour (we paid for our own food). I’ll review the markets and food in another post. We really had a great time on this tour. 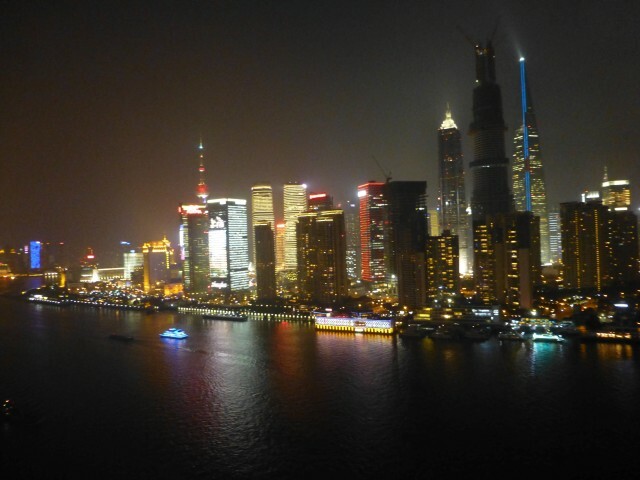 We were able to see so much of Shanghai. 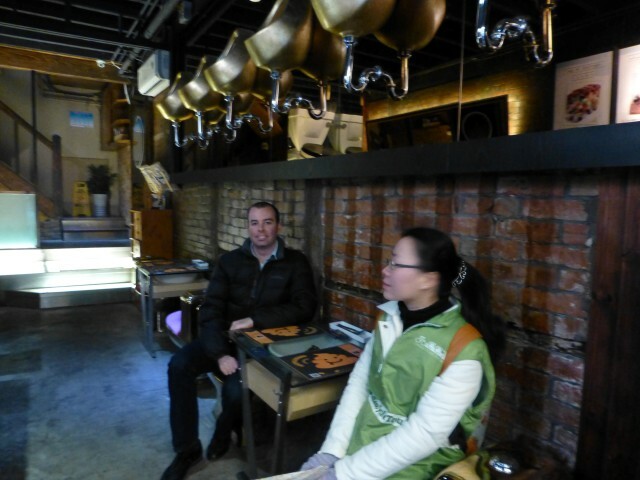 Our tour guide was very good – her English, while not perfect, was excellent. She had to ask for the word a couple times, but it caused no problems with the tour. Our trainee guide had never been on a tour before and she needed a bit of work. She always tried to ride next to me or MS, instead of behind us, so when we’d go through tight areas, she would be bumping into us. She also didn’t have a whole lot of knowledge of the areas or the building we visited, but she was eager to learn – and our main guide did a great job. The bikes were fine – they were comfortable and relatively well maintained, although the biggest issue was the brakes. The brakes were a mushy and you really had to keep a keen eye open and anticipate any issues ahead as the brakes don’t allow you to stop as quickly as you’d like. Would I suggest you tour with Cycle Shanghai? Absolutely! 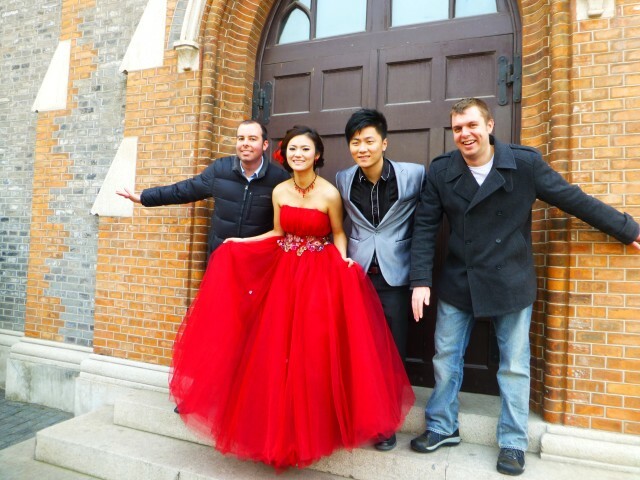 I thought these folks did a great job – they weren’t quite as polished as the folks in Dublin, but it was a fantastic way to spend part of a day in Shanghai – DO IT! I never saw a single person cover their mouth when coughing. I even had a face full of cough a couple times on the Metro (maybe the guy above was right, I would be more comfortable in a taxi). 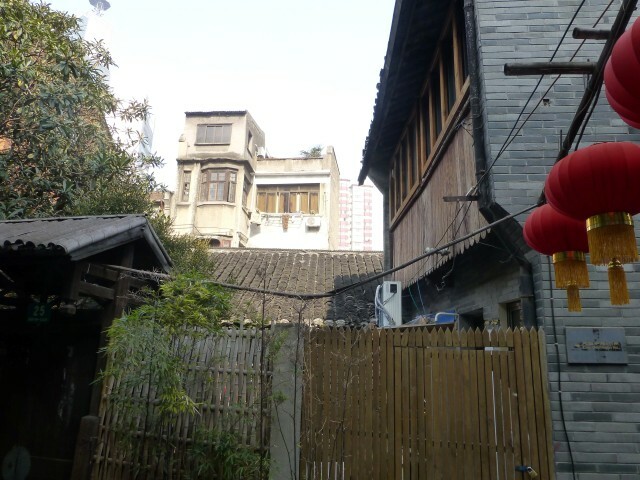 Wide open mouth coughing like Typhoid Mary – a very common site in Shanghai. I don’t think I’ve ever written about Hocking a Loogie – I had to look up the spelling of both of those things. As we walked around the City we constantly heard the coughing and hocking of loogies. Young children, men in suits, women with babies and grandmas so old and shrunken you could put them in your pockets — all spitting their mucous on the sidewalks — or if they were very polite into the gutter. 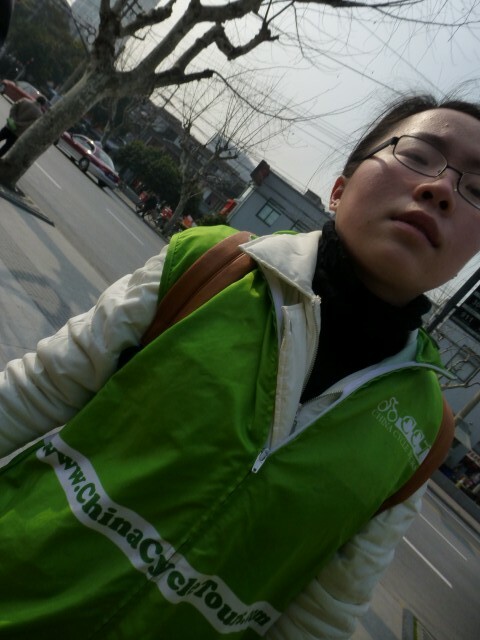 You couldn’t walk the sidewalks without seeing wads of mucous every dozen meters or so. 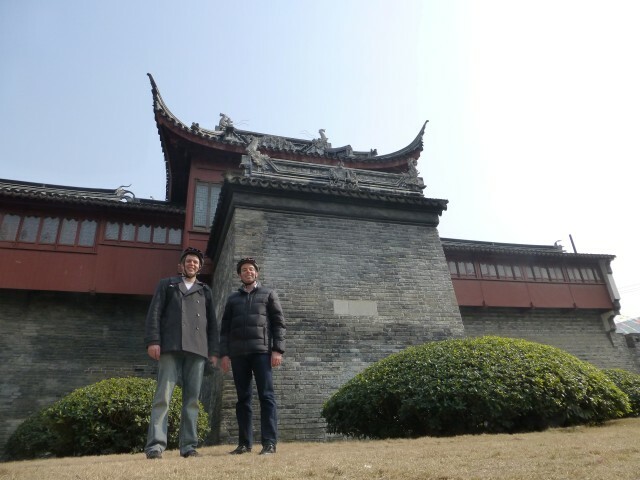 What are some of the personal/cultural differences you noticed while in China — or other places around the world? 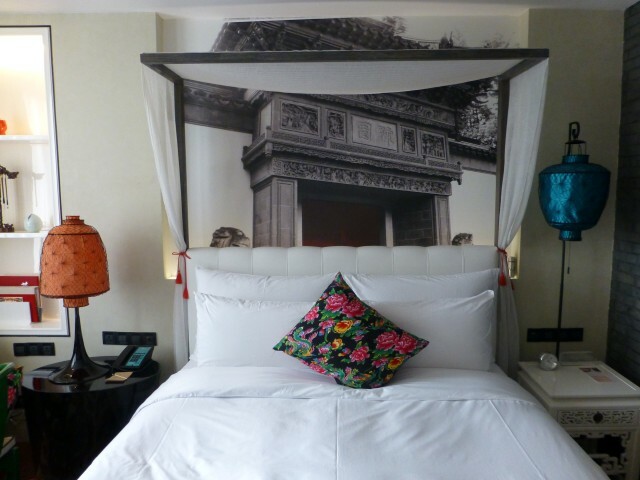 We stayed at the Hotel Indigo (@hotelindigoSH) on the Bund in Shanghai. 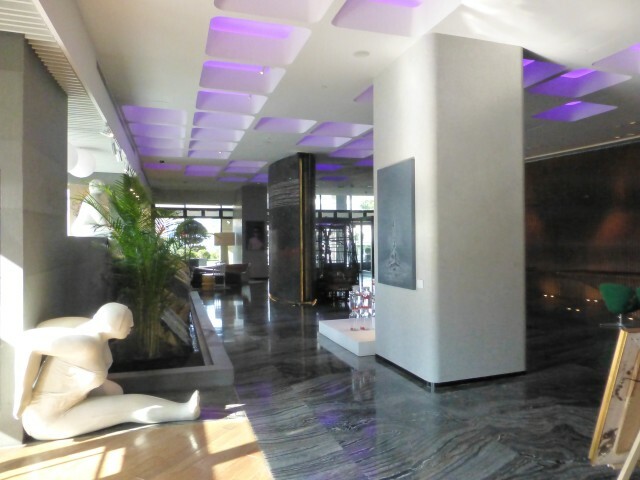 Hotel Indigo is part of the Priority Club hotel group. I have only stayed at a Priority Club once before – the Intercontinental in Manhattan – and that is because EVERY Starwood and Marriott property were completely sold out. When I go to Nashville for work, I stay at a former Indigo Hotel — but since it hasn’t really been updated, it still feels like an Indigo, I just get Starpoints for the stay. Anyway, we stayed at the Indigo because it was reasonable and the better half usually stays at Priority Club hotels while in China (mostly based on availability where he is working). I dig the lobby in this hotel. It is bright, modern, clean and sleek. There is ample seating, but during my stay, I never saw a soul down there. I checked in and was escorted to the elevators, which was a nice, yet totally unnecessary touch. 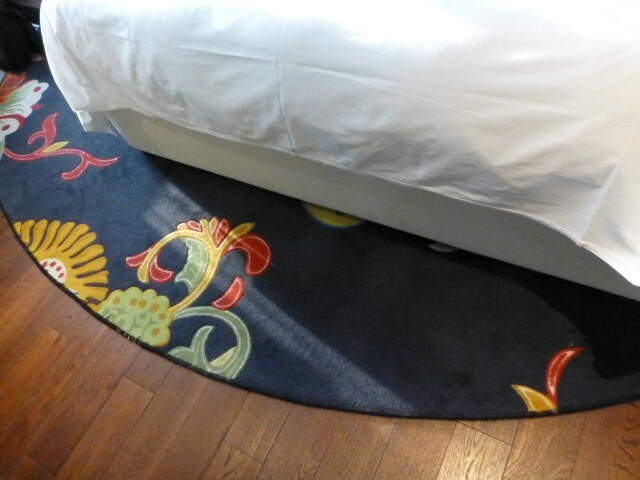 We were on the 20th floor of the hotel and by the time I arrived, I had been up for 24 hours and I needed a shower, a bite to eat and a quick little nap. The room itself wasn’t all that large, but it was really nicely decorated, with a modern Asian motif. 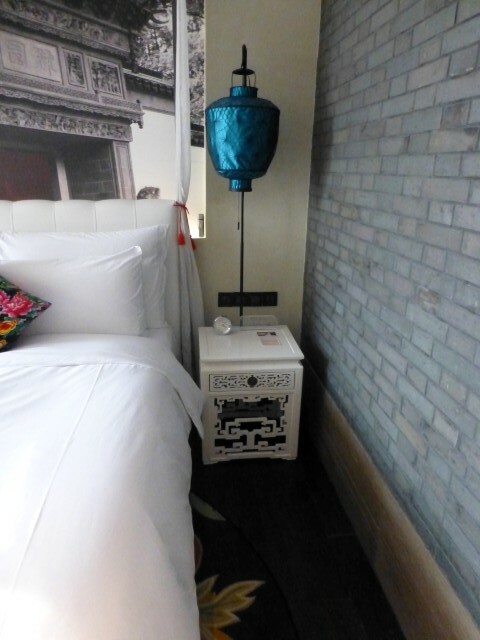 The bed was flanked by two night stand with complimentary lamps and ample outlets. Yes, AMPLE OUTLETS. I was in heaven. There was an interestingly large black and white print behind the leather headboard. Not something I’d do at home, but still it looked pretty cool. The walls were brick as well — not brick wall paper either. While I believe this was just aesthetic brick, it was still cool and looked much better than that god-awful brick wall paper stuff you see from time to time. I really wanted to steal this sign but MS wouldn’t let me do so. The other side is in English and it says what you’d expect it to say: Non Smoking Room. 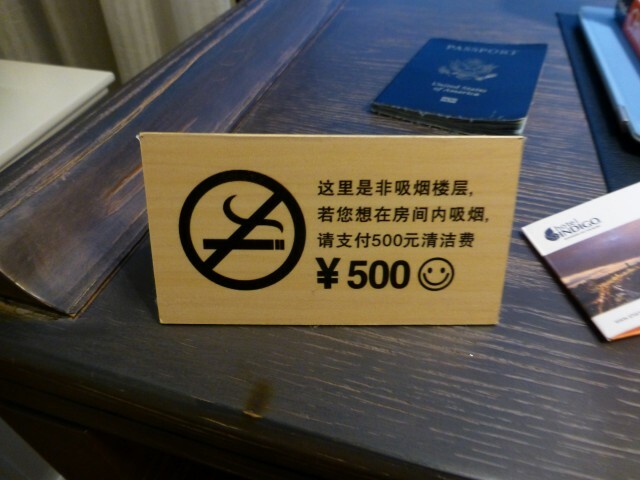 500rmb Fine for Smoking. 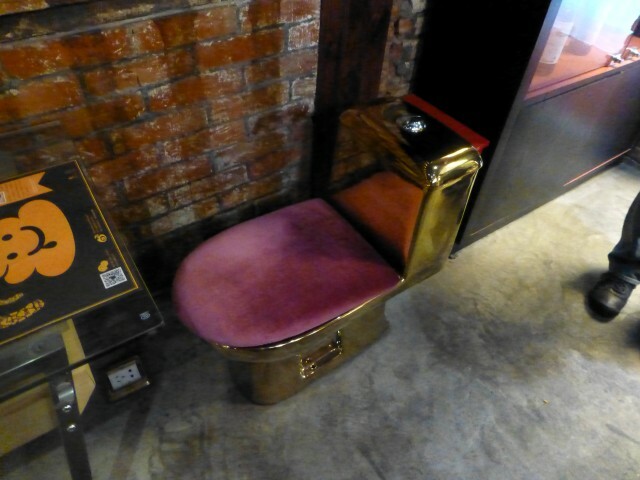 The bathroom was on the outer wall and had a small WC with the most futuristic electronic toilet I have ever seen, a single sink and a large shower room. The counter was a bit low, but then again, I may be a bit taller than their usual clientele. The shower was great! 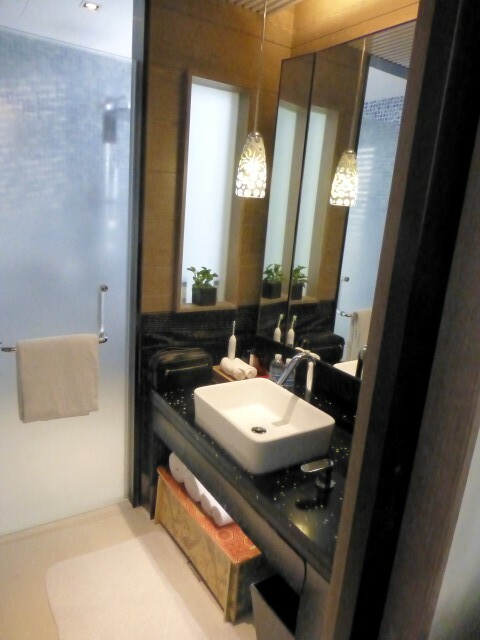 It had beautiful modern tile work, a huge rain shower head and a small window looking out onto a large construction site — but we were 20 floors up, so you just got a view of the City. The shower had great water temperature and pressure. I was quite impressed. The bath products smelled so great, as well. Unfortunately, I didn’t get the brand, but it had such a soothing aroma therapy effect, without that noxious chemical/fake smell. 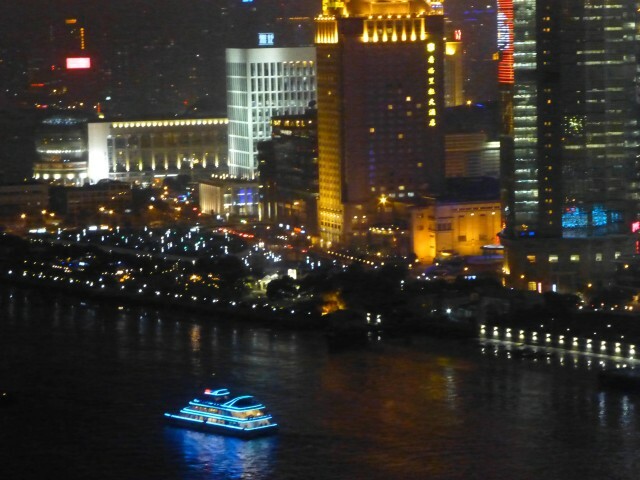 The first night at the hotel, we popped down to the bar, Quay, on the 6th floor. Like most hotel bars, the drinks were a bit steep, but they had some wonderful signature cocktails and the views of Pudong, the first night were absolutely amazing. 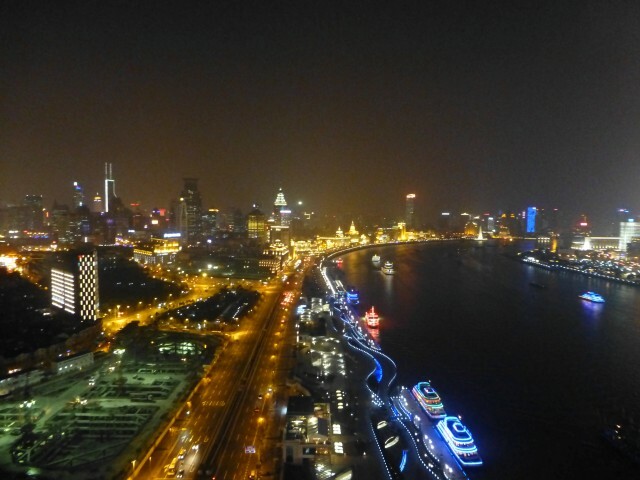 The buildings are lit up so beautifully and you can see the iconic buildings that make Shanghai, Shanghai – including the Oriental Pearl Tower, the Jin Mao Building and the Shanghai World Financial Center. 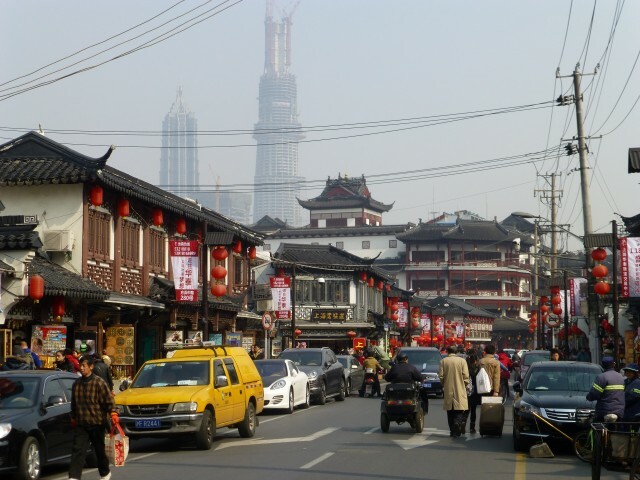 The dark tall building between Jin Mao and the SWFC is the Shanghai Tower, which when completed will be the tallest building in China and the second tallest building in the world (behind Burj Kalifa in Dubai). It will be 632 meters tall with 121 stories. We ate breakfast at the hotel each morning and like the bar, it was a bit overpriced, but everything was very tasty. Each morning I had the buffet (and you all know how much I loathe buffets). I had ham, fruit (best pineapple ever), pastries and a spicy bowl of noodles — when in China, right? While I am not a big Priority Club guy, this hotel was great. 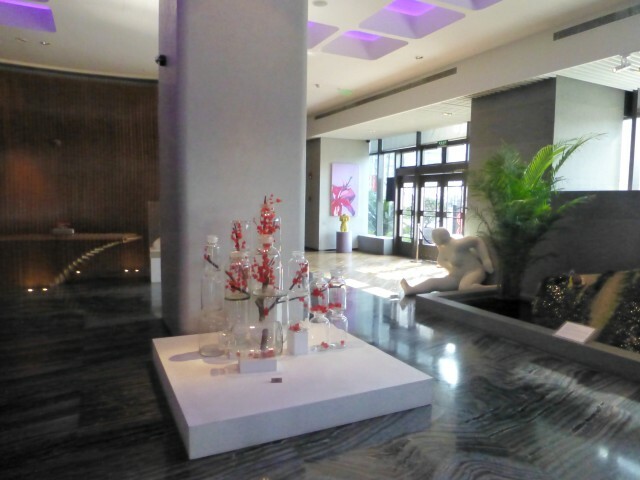 The service was fantastic at every interaction (check-in, doorman, housekeeping, restaurant, bar — all top notch). 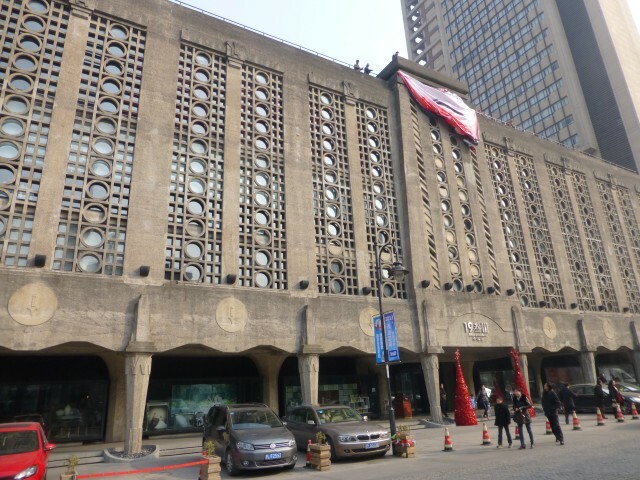 The hotel was quite reasonably priced for the area – although it claims to be on the Bund (and by definition it may be) it is a 20 minute walk from all the exciting things to do on the Bund. I would definitely stay here again. I have nothing negative to say at all about this hotel. Nicely done! 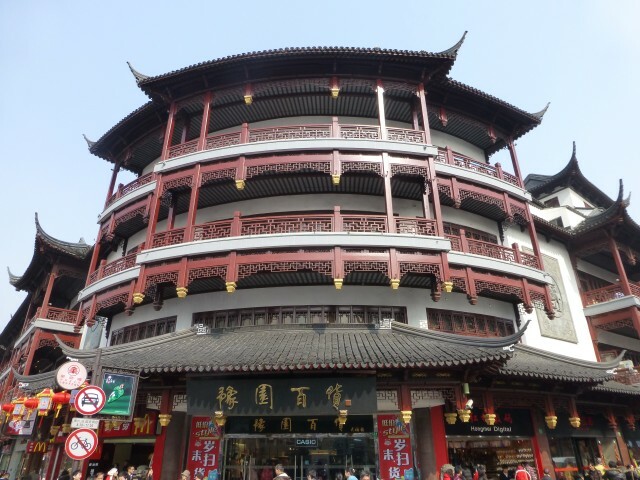 Where do you stay while in Shanghai? Do you try to stay with your regular hotel partners or do you try something new?